Nothing seemed to disappoint Freeview viewers more than the replacement of Men and Motors with ITV Play. Nothing seemed to disappoint Freeview's viewers more than the replacement of Men and Motors with ITV Play. Perhaps the loss of a motoring channel is not the greatest problem in the world but another Quiz channel does not really bring anything to the platform. ITV is expecting ITV Play to make 20m in it's first year of operation a cool 55,000 profit every single day. ITV Play is only one of a large number of "Quiz Channels" that seems to be taking over Freeview. Ftn, who promised new exiting British TV when they launched now offers "Quiz Night Live" from 10pm until 1am. Supposedly a British music channel, The Music Factory becomes "Pop the Q" for three hours each night from midnight. There's 24 hours a day of "QuizCall" which is operated by Channel 4 too. And ITV-1 like some ghastly Cinderella becomes "The Mint" for four hours at midnight, with the ugly sister, ITV-2 joining in at 1am. There are plenty of channels on satellite too, but these offer a slightly different experience. Some of these are fully interactive games, meaning that everyone who is playing is really playing. 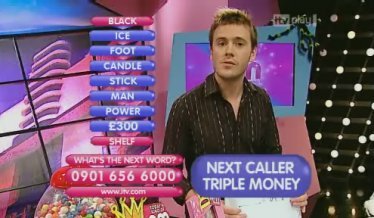 Another form of televised betting are the "quizzes" found on daytime TV (and sometime on primetime TV too) where you can ring in with the answer to a blindingly easy question in an attempt to win a prize. Most of the recreational betting that people do (in a bookmaker's or on a sports betting website) and the officially sanctioned "national lottery" is called fixed odds betting. If you buy a lottery ticket or scratch card, or use a fruit machine (aka one-armed bandit) in a pub, somewhere the odds of your winning will be written down. You know what amount of money you are gambling, how much you can win and your chances of winning it. For example, the Rubik's Cube game listed on the National Lottery site says "1 in 3.38 overall chance of winning a Prize". Some of the games on the Sky digital system are also fixed odds games. The amount you stake is dependant on a choice and the odds of winning are fixed beforehand. So the classic Avago "bingo" game is fixed odds, as is their roulette game. So it does not matter how many other players are playing the game, or how long the game lasts, your chances of winning the prize and the size of the prize are known before you start. Until very recently, this was the old sort of game that was allowed. How often do you see programmes such as "This Morning" plugging this kind of quiz before the advert break? What is the name of the Queen, is it A) Kilie B) Elizabeth or C) Victoria? There will be some prize (sometimes cash, sometimes goods of an unknown value). Call cost about 1 to enter, so why not have a go, even if the answer is obvious? If you are the only person to phone in, and the prize is 100, then that's fine, you win. But how many other people will phone in? If it's a thousand, then that reduces your odds to 1:1000. If ten thousand people phone in, your odds go down to 1:10000. The important point here is that you do not know. The more people that enter, the lower your odds of winning and you have no idea whatsoever. TV companies never announce how many people entered each quiz, or give on-air progress reports. (To make the 20m annual profit, assuming that ITV get 30p per minute, this would require 130 people on the line together waiting to 'get though'). And so it is with the late-night TV quiz programmes and all-day Quiz channels. And what is more, is these channels pull another trick. By using charge-by-the-second premium rate numbers for you to call in on, they can keep you on the line. So, not only do your chances of winning decline as more people enter the game, but your stake increases by the second. Another problem for these channels would seem to be that they make no effort whatsoever to appeal strictly to adults. The original alchopop drink, Hooch, was derided (eventually) for featuring a cartoon on the label, and it seems to me that most of the Quiz channels are doing the same thing. I have switch over and seen "name these cartoons" quizzes on ITV Play and the music and graphics are generally much closer to the CBBC channel than anything else. There is no sizable on-screen warning that players must be 18 or over. So, ITV Play expects to make 2,283 profit every hour of every day. It enough to make you want them to bring back Blind Date! The committee, which is chaired by the Conservative MP John Whittingdale jwhittingdale.mp@tory.org.uk, has called for written submissions on the issue to be made by November 16.